Are you looking to create a more sustainable lifestyle? 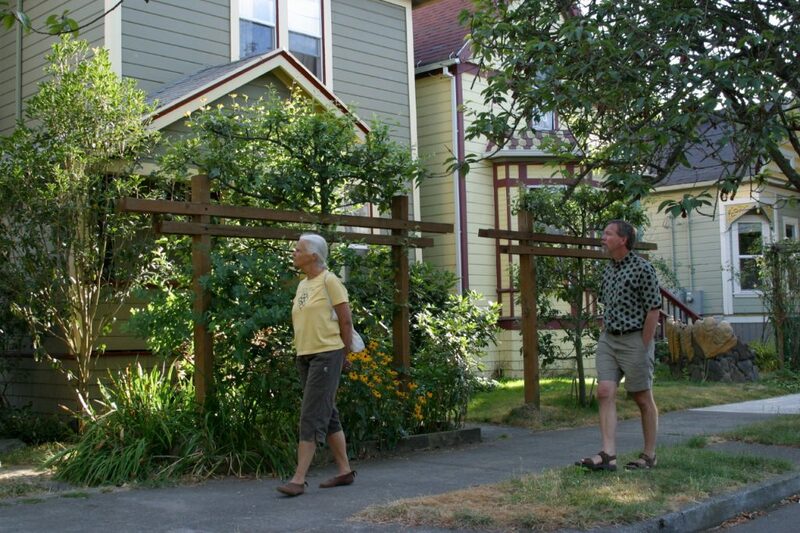 Retrofit your house, your community and your life? Become less dependent on big business and supermarkets? Design a resilient system in the face of growing uncertainties? A PDC can be a life changing experience. 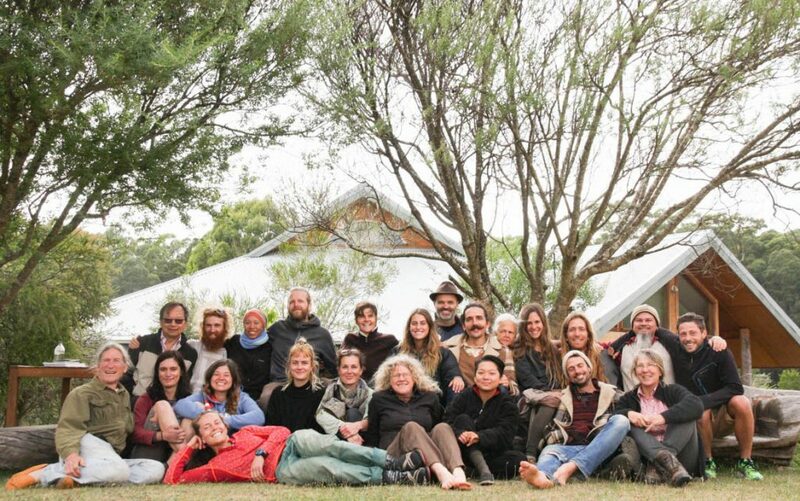 Join us in the unique environment of the Rocklyn Ashram and be taught by a mix of experienced and enthusiastic permaculture tutors including David Holmgren. This is a fully residential, fully catered course running over 15 days with a short break in the middle. This is a completely immersive experience. 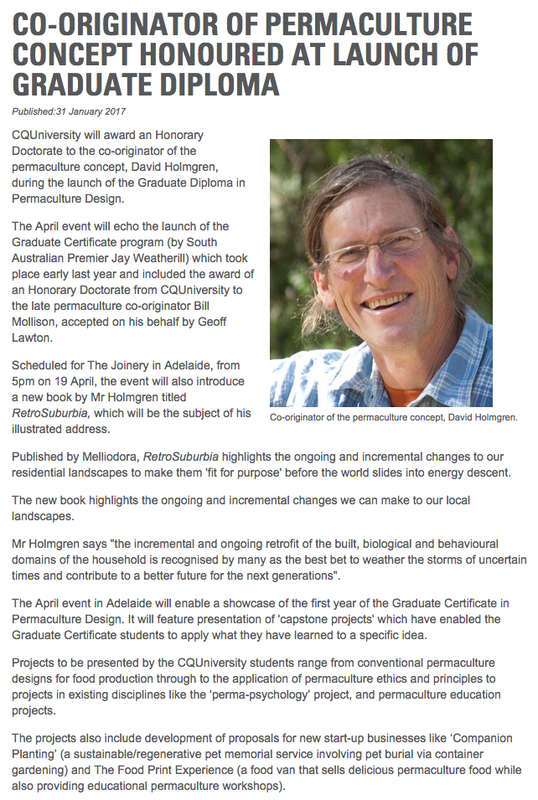 The course will be structured around Holmgren’s 12 permaculture principles (detailed in Permaculture: principles and pathways beyond sustainability) and goes beyond land-based design, bringing permaculture to all aspects of human living. The course will take place at the Rocklyn Ashram, nestled in the Wombat Forest near Daylesford in Central Victoria. Only a one and a half hour drive from Melbourne, you will feel like you are in another world. Beautiful and quiet, this special space creates an ideal learning environment. Taking part in the ashram’s daily yoga program can further enhance your learning and enrich your experience. The ashram environment exemplifies and provides an experience of living by permaculture ethics. The serene and spiritual focus of the ashram complements the mindfulness of permaculture practice and reminds us to balance our activity and think with reflection. Accommodation is camping in the grounds of the ashram. You will need to BYO tent and gear. Alternatively you can choose to stay in a gender segregated triple share dorm room or a private room. Please note, these last two options incur additional fees. At times the ashram program and the intensity of the course can seem challenging, however almost all of the participants comment that the benefits continue long after the course ends. Delicious, wholesome and ethical meals will be prepared by Su Dennett and the ashram’s kitchen volunteers. Su will make sure that what you eat meets permaculture standards. Items will be sourced from local organic and bio-dynamic growers in a living example of using and maintaining sustainable food supply networks. You will be served vegetarian meals together with the ashram residents. 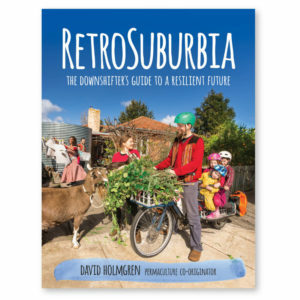 You will learn from the co-founder of permaculture, David Holmgren, and a team of excellent permaculture practitioners and educators. Their depth of practical and theoretical knowledge will make this a very special PDC. There will also be opportunities to socialise with the presenters outside of session times. 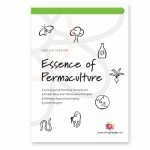 There are no prerequisites for this course, but it is recommended you read the Essence of Permaculture if you have not yet done so. All other titles and writings by David Holmgren are highly recommended for those who have read Essence already. Please have a look through our online store or visit your local library. This course will equip you with the foundations of permaculture. 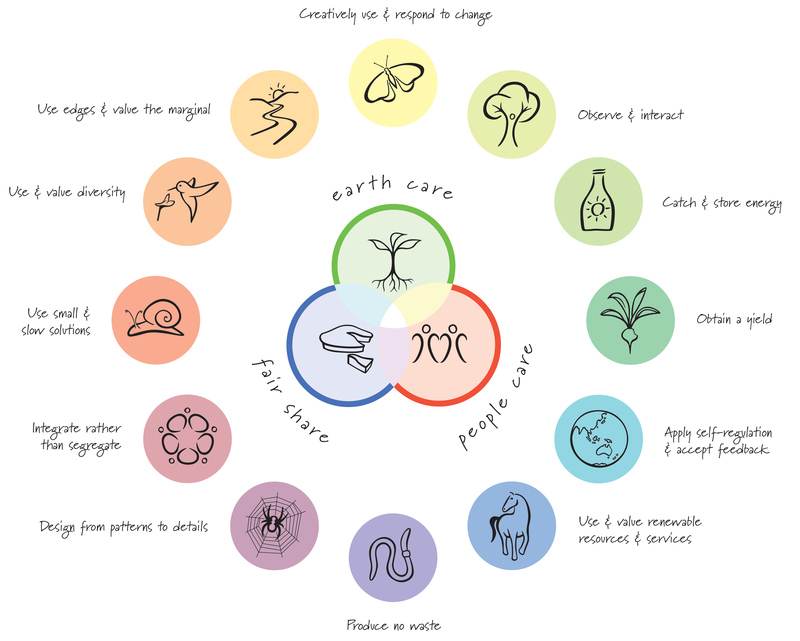 You will learn permaculture ethics, principles and design, and their application across the domains, so that you can integrate them into all aspects of your life. The classroom experience will be complemented by field trips to working permaculture farms, homes and gardens including one of the best documented demonstration sites, Melliodora. You will work on a design project of part of the ashram during the course. 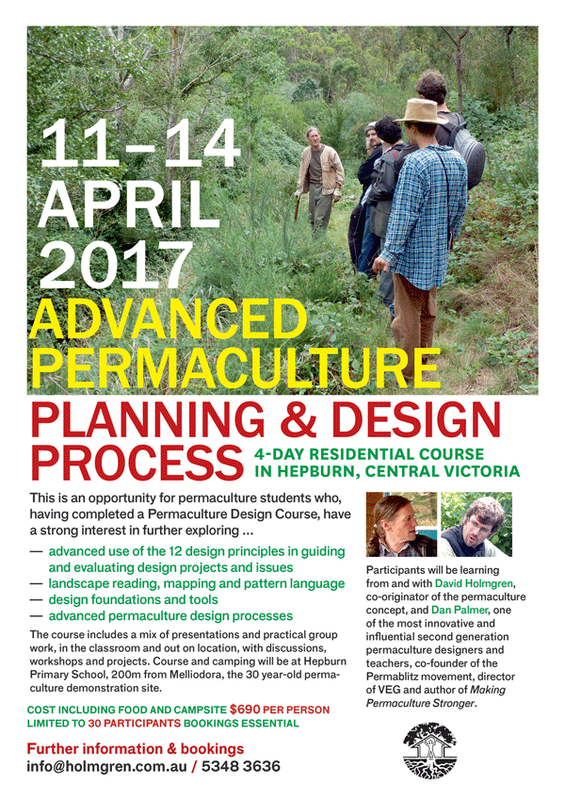 You will be guided by experienced tutors and learn the fundamentals of permaculture to design the world you want. Is there a concession price? Applications for the concession rate have now closed. Still have questions? Please read through our FAQ page. If the 2018 Ashram PDC sounds like it’s for you, fantastic! Please secure your place by registering. 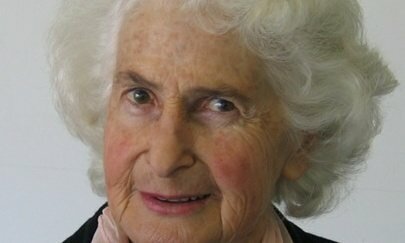 One of Australia’s ecological farming pioneers, and a close friend, passed away today. Rod May aged 63 died in intensive care after a road accident between Ballarat and his family farm at Blampied 5 days previously. Rod was a 4th generation farmer on 200 acres at the foot of Kangaroo Hills in the prime red cropping country of central Victoria. In the late 1970’s Rod returned to the farm motivated by interest in self reliance, organics and tree crops and “fell back into farming” as something to do in between starting the Central Victorian Tree Planting Co-op and getting elected to the very conservative Creswick Council. The Landcare movement emerged simultaneously in several regions across Australia in the late 70’s and early 80’s. One of those places was central Victoria and Rod May played a leading roll in it. 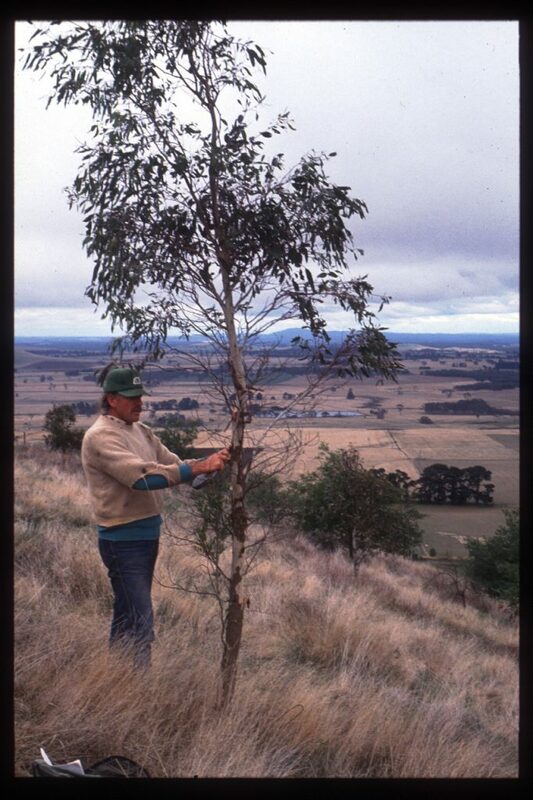 In 1983 when Project Branchout received federal funding to employ people to plant trees on demonstration sites right across the Campaspe, Loddon and Avoca catchments in response to the threat of salinity, the committee fell on their feet in employing Rod and his crew from the CVTPC to manage the huge program. Rod had the same holistic vision of the committee, the ability to take risks, roll with the punches and engage with conservative farmers, and with some of the unemployed workers putting the trees in the ground. Most importantly he had dirt under his nails as both a farmer and tree planter. 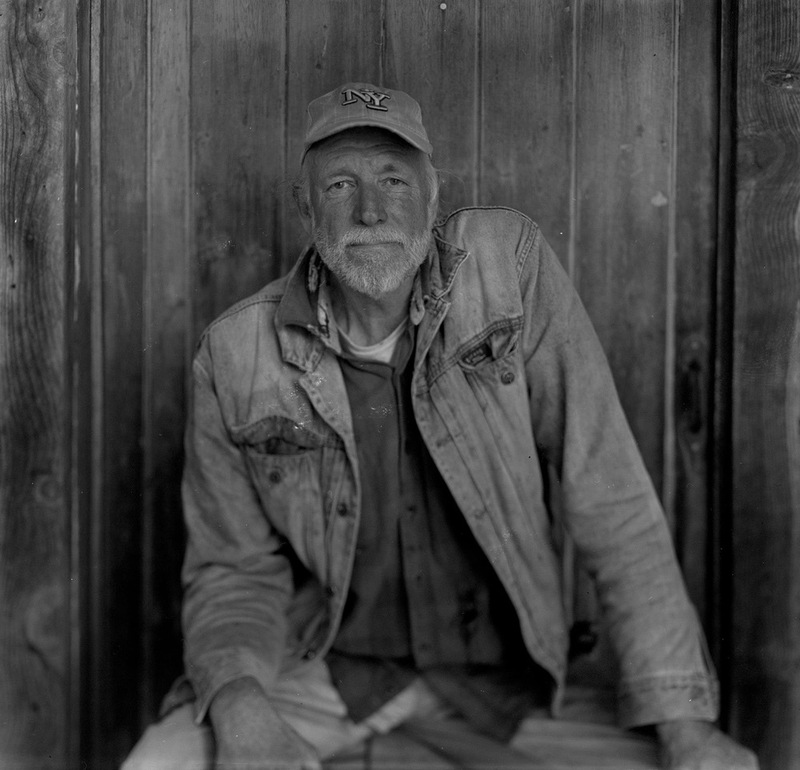 Rod was not part of the first generation of organic farmers but he was one of the generation that integrated the new ecological thinking of the 1970’s including permaculture, and connected it to the emerging markets for organic produce that lead to organic certification in the late 80’s. 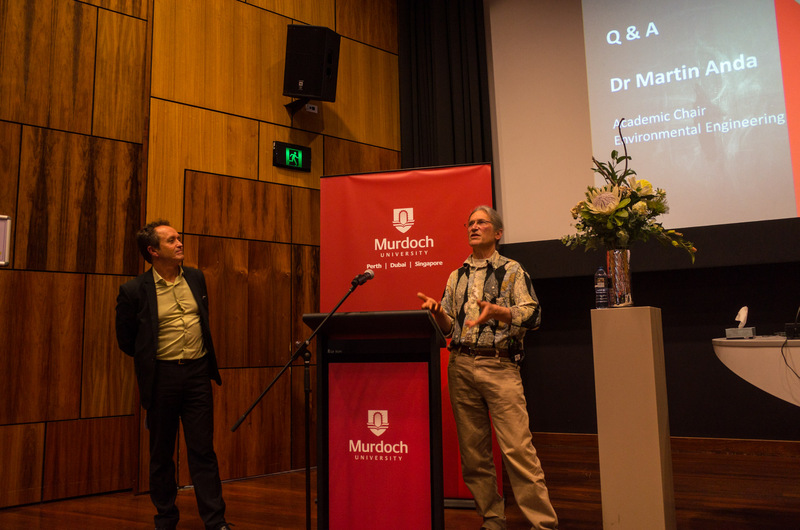 As founding president of the National Association for Sustainable Agriculture Australia (in 1986) Rod May was at the forefront of driving the importance of links between ecological science, organics and the emerging sustainable development concept. At the same time he was converting his part of the family farm to organics, implementing large-scale plantings of shelter, fodder, timber, fruit and nut , still working for Project Branchout in their Bicentennial revegetation of the Captains Creek Catchment that included the family farm. As plantation designer I worked closely with Rod at that time and remember when he and I headed up the steep slopes of Kangaroo Hills overlooking the May family farm to get some of the shelterbelts in the ground. I had my two-year-old son Oliver to help us and that began a thirty-year bond between Oliver and Rod. As organics grew in the 1990’s, Rod spent an increasing amount of time in meetings around the country and the world making the global linkages through the International Federation of Organic Farming Movements and doing some of the first organic certifications for farmers ranging from cranky older generation organic pioneers to coffee growers in East Timor and lake bed croppers in the semi arid zone. His keen observation skills, memory for facts, figures and protocols, his slow talking easy going manner and his enjoying a beer or, in the right circles, a joint allowed him to tackle novel situations and always learn something new. This understated diplomacy allowed Rod to work with the idealists and the pragmatists of the organic movement, even if his sometimes slap dash approach to getting things done in drafting a document or consigning pallets of veggies left his partners frustrated and sometimes having to pick up the pieces. Life at home with Viv and their daughters Stephanie and Carla, as well as his brothers Greg, Doug and their families on the family farm was not always smooth but as an outside observer, one of the ways in which Rod contributed to harmony was a tolerance of whatever others dished up for him. He and Viv lived fairly independent lives but their wide social circle and love of a party kept them going between their respective passions for organic farming and teaching. I can remember Su phoning Rod’s father Maurice to find out where Rod was and the exasperated answer; somewhere in America and I don’t know when he’s back. But I also remember marvelling at Rod getting back from an trans pacific flight then the same afternoon jumping on the tractor to plough up the new veggie cropping paddock before the rains came. During those years of globe trotting Maurice provided a back stop for Rod and supported the organic methods which were adopted by brothers Greg and Doug. Like his father, Rod was a big bloke and worked like few of the baby boom generation could. Within the organic/green movement intellectuals he was as sharp as the best of us but in the spud paddock, no one I know could work day in day out like Rod. 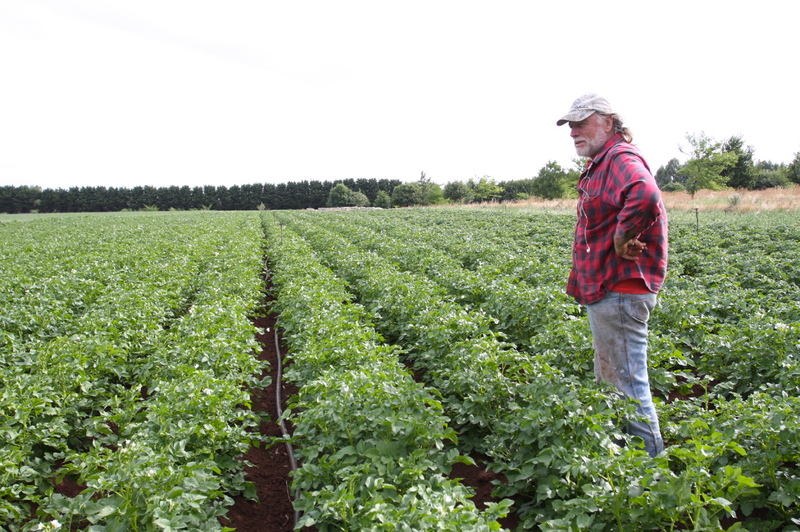 I remember when I had a chronicly bad back he told me in all seriousness that picking spuds was great for fixing a bad back. In his later years his knees began to give him trouble after all those years working across the furrows and mounds of several acres of irrigated vegetable he cranked out year after year. 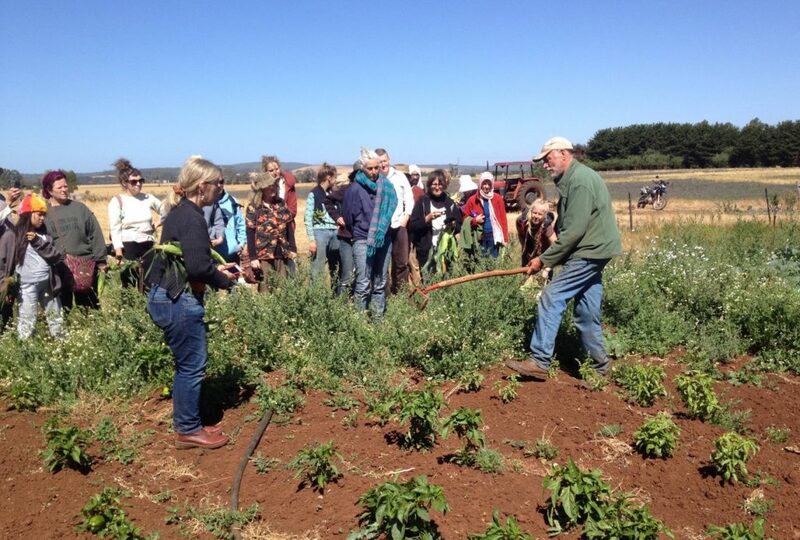 In the early 1990s we began taking our residential Permaculture Design Course participants to his farm to get a taste, literally, of a real organic farm that best illustrated permaculture principles supplying local and central markets with basic food. Rod’s seamless grasp of everything from soil ecology, tree crop potentials, organic marketing and mechanics and gadgets involved in farming, was immense. We would go out and harvest the veg that didn’t meet commercial standards and take it back to the farmhouse where Su would organise the roast lunch with Maurice helping cook the farm killed mutton. While we promoted Captains Creek as a good example of permaculture, Rod never did. In a piece I wrote in the early 1990’s I said many ecological pioneers who chose not to describe their work as permaculture did so for one of three reasons; because of the bad examples they had seen called permaculture, because they didn’t want to alienate more conservative audiences or because they didn’t think what they were doing met the high ecological standards they associated with the permaculture concept. In Rod’s case I believe it was a mix of the three with the last being the most important. During the 1990’s I watched the rewards and strictures of supplying central markets pushing Rod towards being a specialist broccoli producer supplying Melbourne, Adelaide, Sydney and even Brisbane markets in mid to late summer when it was difficult for producers in warmer districts to do so. Rod was surprised at his own success. 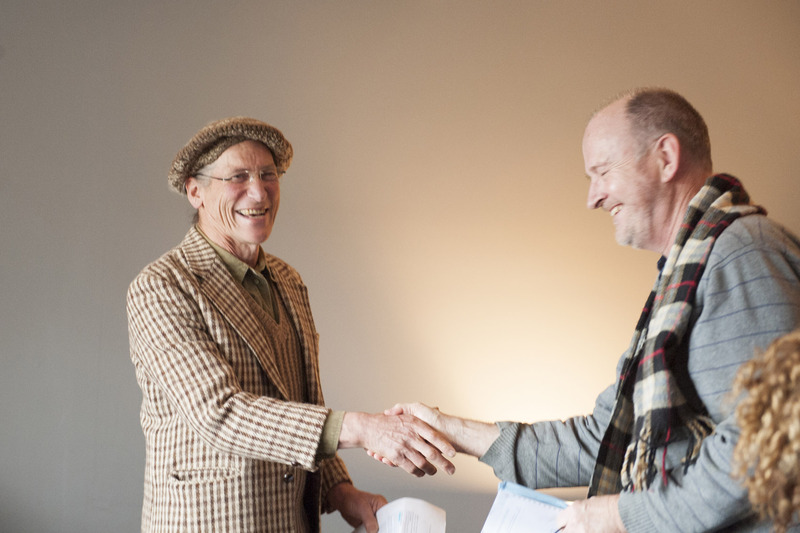 He thought that once the market for organics became established, the big specialist vegetable growers would take over and that he would head the other way diversifying to supply local markets using methods he had seen working in Europe, Japan and the US including farmer’s markets and community supported agriculture. 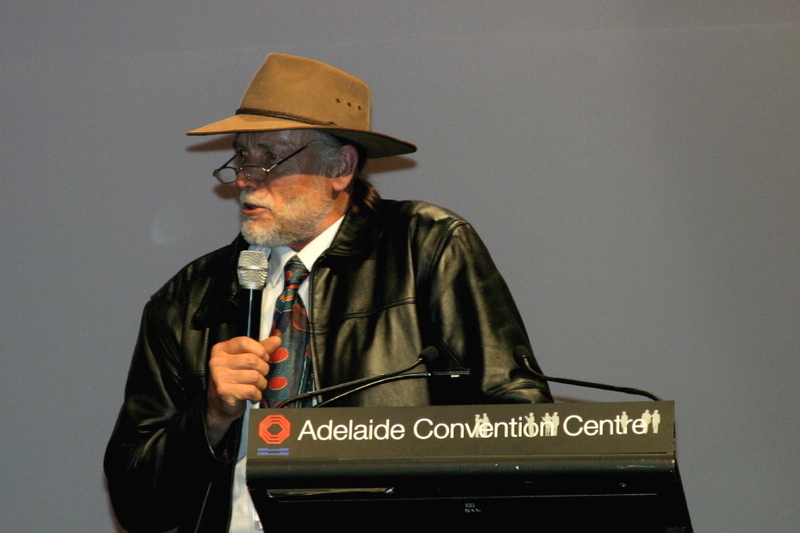 Rod’s involvement in the international organic scene continued with his membership of the scientific advisory board, IFOAM and in 2005 in bringing the IFOAM international conference to Adelaide. But over time he started to organise his exit from organics politics and to encourage the next generation onto the board of NASAA including our son Oliver. Rod’s political focus shifted back to local government and in 2006 he was elected to the Hepburn Shire. 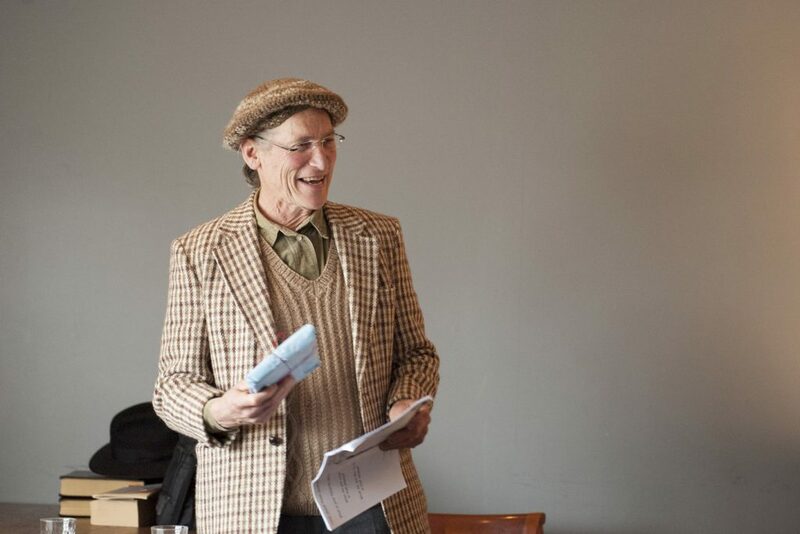 Su recalls that Rod was rather slack about campaigning, but his charm, laid back style and ability to connect to the average person got him over the line. Around the same time after some pestering by Su to produce boxes for local customers instead of all being shipped off to central markets, Rod asked her when she wanted to start. 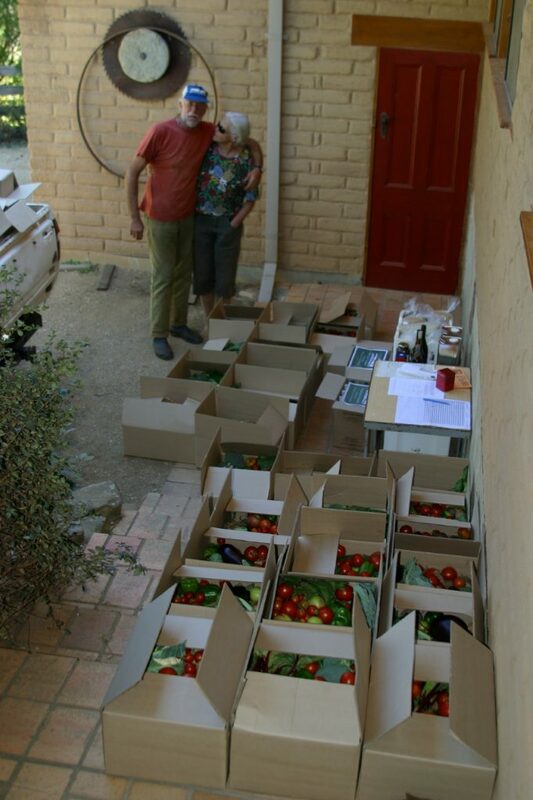 The next week Rod delivered 6 cardboard boxes full of mixed unwashed veggies to our place for pick up by the customers that Su had organised. Over the following couple of seasons Rod turned his whole farming operation around to focus on boxes delivered to Hepburn, Castlemaine, Ballarat and Melbourne. In the same way that centralised markets reward monocultural specialisation, box schemes demand diversity from the farmer. The fact that Rod turned his relatively large production scale around to supply that diversity was testament to his skills as a farmer. Rod’s fields were rough and ready even by organic standards, full of weeds and some produce not making the grade but the productivity from limited and often erratic input of skilled labour was truly amazing. Apart from extra needs for catering for events and courses, we have always grown our own produce without the fuel and gadgets (Rod’s term for farm equipment) that sustained Rod’s farming operation but there were years where in disgust I thought I should give up and just buy from Rod. Whatever the season and the weather Rod just kept on delivering and at the end of the season the weedy fields full of left over veg was good to fatten the sheep after the gleaners had their share. My personal comparison with Rod led me to assert that I am probably a better ecological builder than ecological farmer but I know what the world needs more. We have enough buildings already but we need to eat each day. On council Rod was a mover and a shaker, using his deep experience with negotiation and decision making, process and protocol to good effect but in a context very different from the parochial years on Creswick council in his youth. He championed a Climate Change and Peak Oil policy for Hepburn Shire, the second in the state and a number of other pioneering initiatives at a time when Hepburn was becoming famous for the first community owned wind farm in Australia. After Viv died tragically in the Samoan tsunami in 2009 Rod poured himself into local council, and as mayor contributed to the growth of the local food culture as central to the tourist economy of the region. 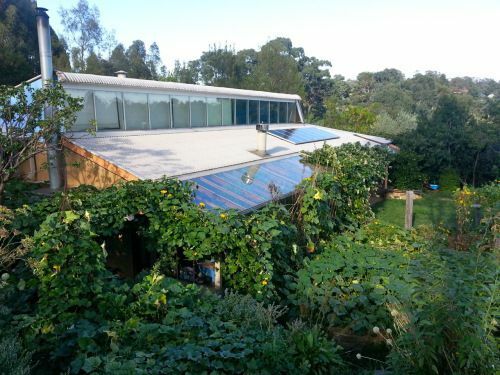 In 2011 he managed to get funding for an Energy Descent Action Plan for Hepburn shire but Rod’s vision and the consultancy that I delivered in response were too radical even for our progressive environmentally aware community. On the home front Rod began to focus on the future with development of Viv’s Lang Road property and a vision for the farm into the future. 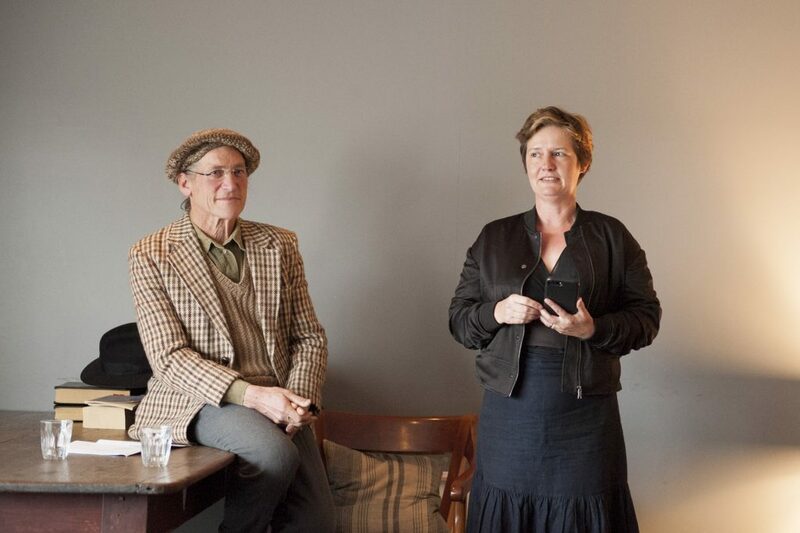 After leaving council Rod threw himself into a farm redevelopment plan at the same time as he was active in the Greens, supporting his daughter Steph’s candidacy, and even stood for the Greens in the seat of Ripon. He did try to engage me in a farm planning process but with my focus on teaching and writing, Rod couldn’t wait and in typical style he whipped up cabins, an autonomous power system, new fencing, a farm processing shed and other infrastructure necessary following the formal division of the farm between the three brothers following Maurice’s death. It was only around this time that I discovered my good mate had originally trained as a diesel mechanic and that his ability with machines was more than rudimentary but like everything else if a vehicle or machine was working, Rod’s energy was focused elsewhere. If machinery failed, like sheep getting into the crops, Rod could just cut his loses and move on. Rod was also a motorbike rider, what a friend and local doctor called “a temporary citizen”. Just another one of the risks he took along with the weather, the crops, the politics and at times the law. But I know that while Rod had incredible energy he was not manic and not ever what I would call reckless. When his luck ran out on the way home from Ballarat after getting a tool for current building projects, the wonders of modern intensive care gave the hope of a rebuild and another chance for my old mate Rod to at least pass on his incredible knowledge of the farm and life to the next generation. But that process was already well underway. 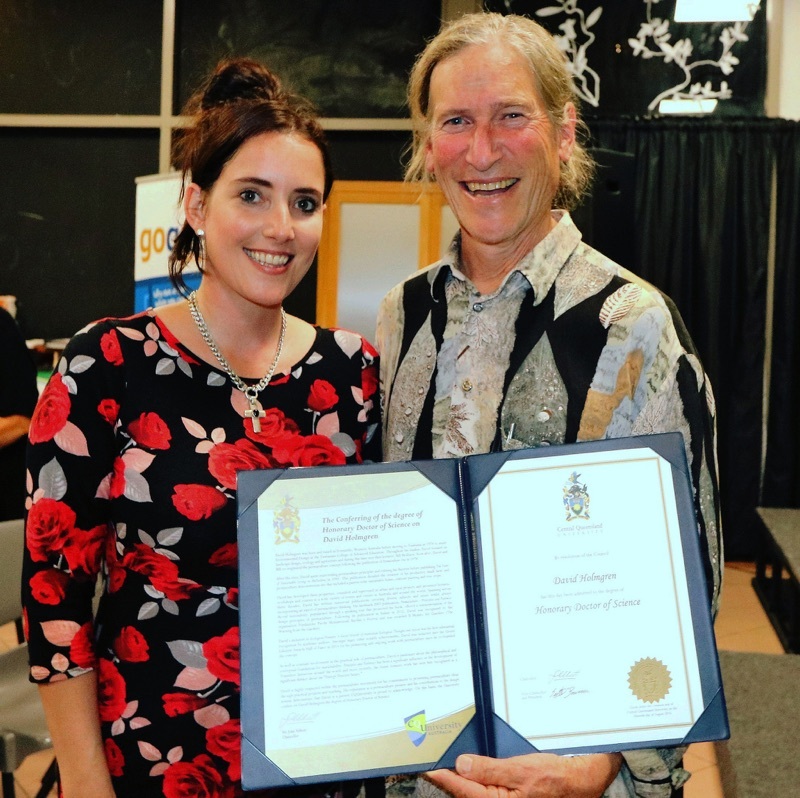 After decades of working with and teaching volunteers, interns and community members the in and outs of farming, Rod had been working with his daughters on the farm future. Stephanie and her partner Oggy along with his bother Serge have been working to keep Captains Creek organics humming. To Rod’s family, daughters, Steph + Carla, and his brothers, Greg and Doug, we send our love and deepest condolence. You can read the obituary Jason Alexandra and I wrote for Rod in The Age here. All entries must be received by 11.59 pm EST, Friday July 14 2017. 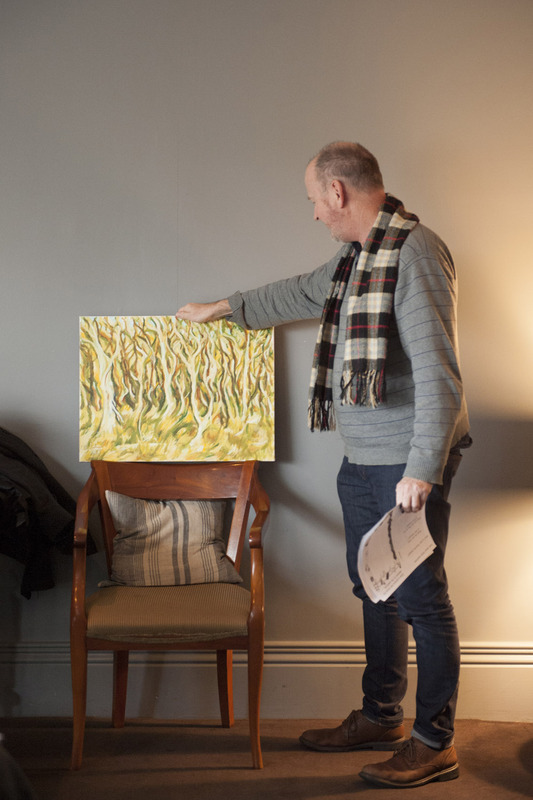 The shortlist and winner will be announced during the Daylesford Words in Winter festival, August 4-6, 2017. The judges for the 2017 competition are Ross Gillett and Fiona Hile. 1. Entrants must be citizens of Australia or New Zealand or have permanent resident status in Australia or New Zealand. 2. Poems must be unpublished (including online) and not under consideration by other publishers. 3. Poems that have won or are under consideration in other competitions are not eligible. 4. Poems must have an environmental theme. 5. All poems must be written in English. 7. An entry fee of $10 will be charged and is payable via bank transfer, PayPal, cash or cheque. A receipt will be sent as confirmation once the money has been received. 8. The name of the poet must not appear on the manuscript (including the header or footer) since all poems will be considered anonymously. 9. Poems must be no more than 80 lines. 10. Multiple entries are permitted, though a $10 fee applies to each poem. 11. Please ensure you are satisfied with your poem before submitting. Poems that are withdrawn and subsequently resubmitted will incur a second fee. 12. The competition closes 11.59 pm EST, Friday July 14, 2017. 13. Selection will be made by the judges. The judges’ decision is final. No correspondence will be entered into. 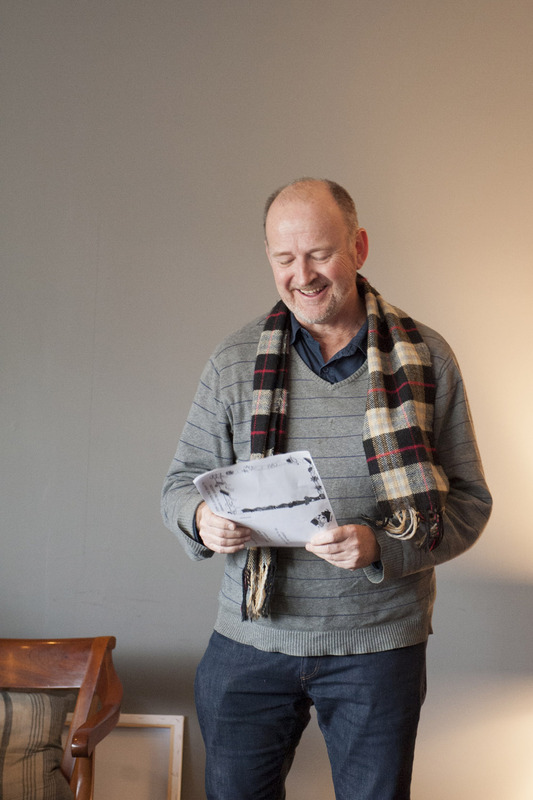 Ross Gillett’s poems have appeared in The Age, The Australian and The Canberra Times and in journals in Australia and the US. His book, The Sea Factory was one of the Five Islands Press New Poets 2006 series. 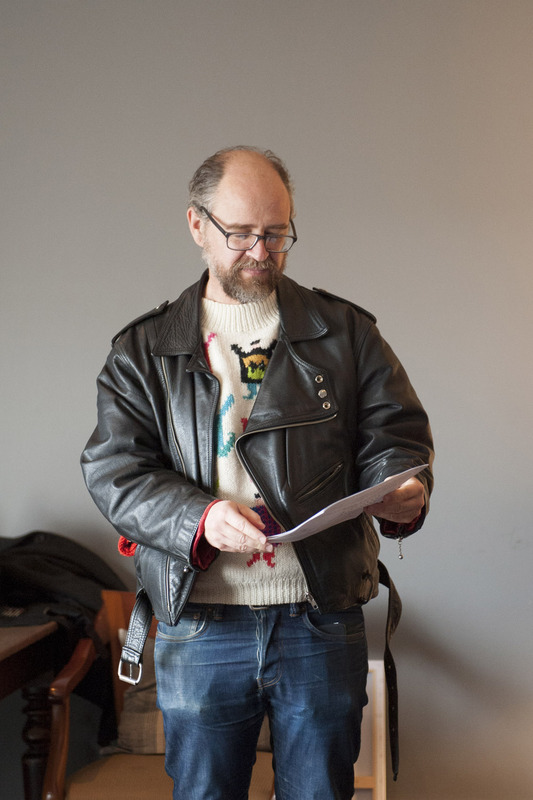 In 2010 he published a chapbook of old and new poems – Wundawax and other poems – with Mark Time Books. 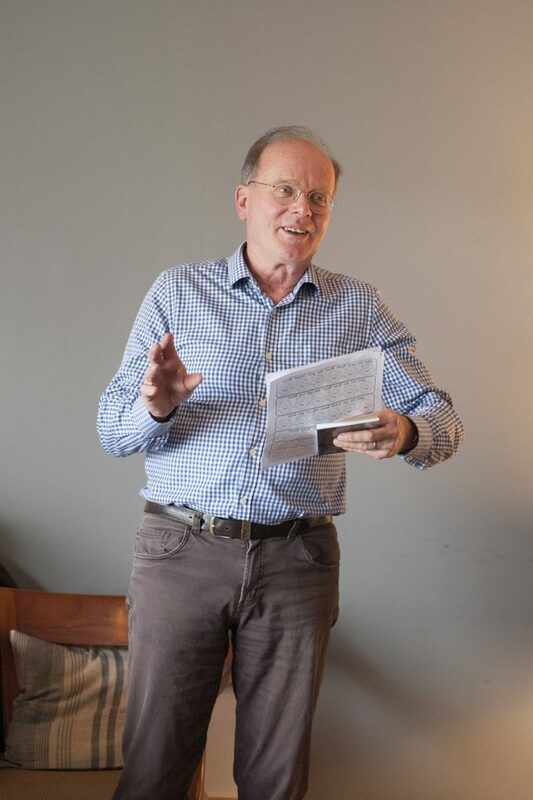 His awards for poetry include the Robert Harris Poetry Prize, the Broadway Poetry Prize, the FAW John Shaw Neilson Award (twice), the Melbourne Poet’s Union National Poetry Prize, the Reason-Brisbane Poetry Prize, the City of Greater Dandenong National Poetry Prize and the Woorilla Poetry Prize. He has been twice shortlisted for the Blake Poetry Prize and was awarded second place in the 2016 Newcastle Poetry prize. Ross lives in Daylesford where he works as a project manager for the Department of Environment, Land, Water and Planning. 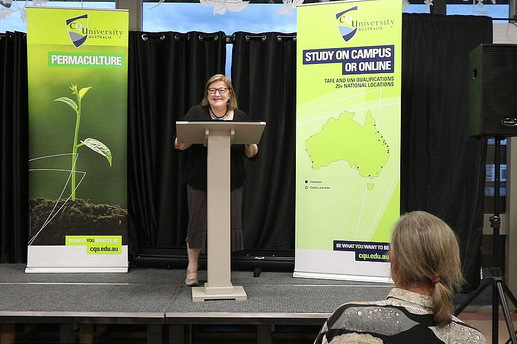 Fiona Hile’s first full-length collection, Novelties, was awarded the 2014 NSW Premier’s Literary Awards Kenneth Slessor Prize for Poetry. In 2012 she won the Gwen Harwood Poetry Prize and was awarded second place in the Overland 2012 Judith Wright Poetry Prize. Her poems have been published in journals, newspapers and anthologies in Australia, Canada, UK, US, Prague and The Netherlands. Her second book of poems, Subtraction, will be published in 2017. 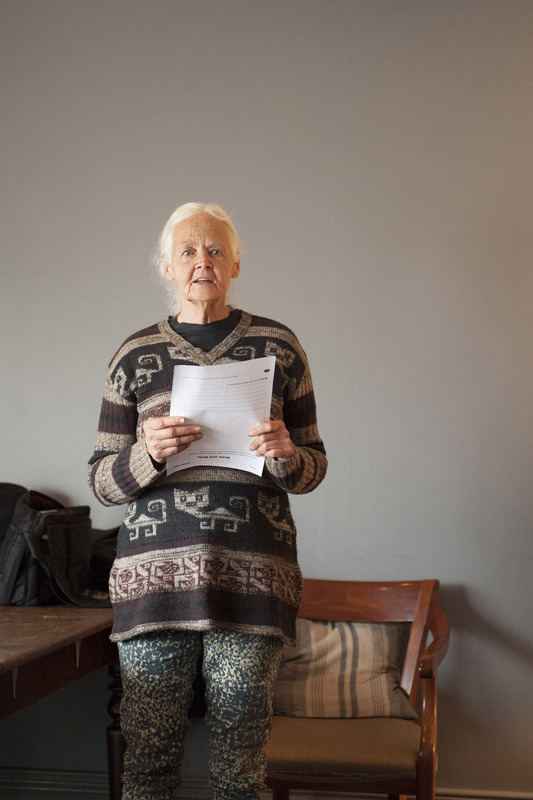 In her late 50’s Venie Holmgren began to write poetry and her first published anthology, The Sun Collection for the Planet in 1989, became a poetry ‘best seller’. At the same time, she applied her environmental activist skills and commitment to the campaign to save native forests near her home on the far south coast of NSW, where she was arrested twice for obstructing log trucks. After 16 years of solo self-reliant living she moved to the local town of Pambula where she penned her travel memoir, several more books of poetry and travelled widely as a performance poet. 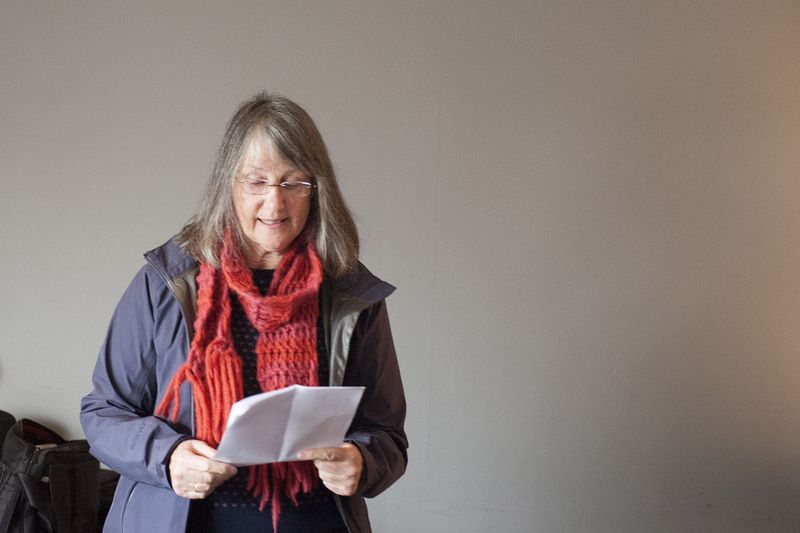 In 2010 Venie moved to Hepburn where she wrote her last poetry collection, The Tea-house Poems. In January 2016, Venie “caught the bus” at the age of 93 . 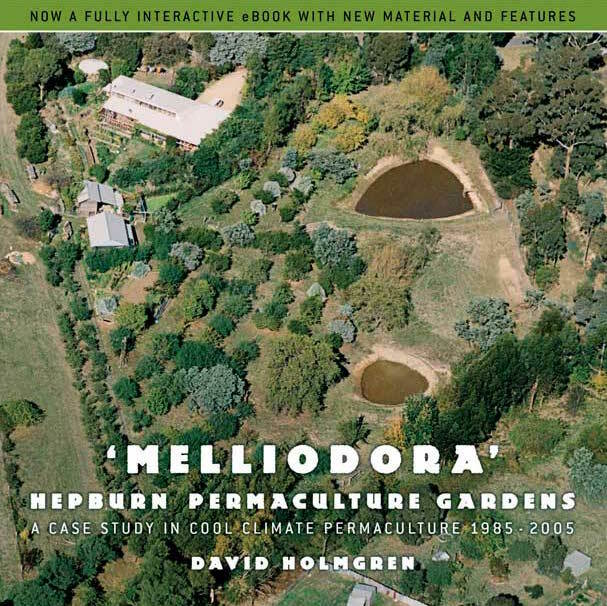 Whatever stage of life you are at, there is no better insight into the ins and outs of how permaculture works on a season to season, day to day way than to take part in the whole day guided tour of Melliodora. The 2017/2018 Melliodora tour dates are as follows: Sunday September 3, Sunday October 1, Sunday November 5, Sunday December 3, Sunday January 14, Sunday February 4, Sunday March 18, Sunday April 1 and Sunday May 6. The tour begins at 10 am. In the morning you will be shown around the house. We will break for lunch between 12.30 and 2pm. In the afternoon the tour will take you to the garden farm, and the day concludes at 4.30pm. The tours are very popular – we advise you BOOK NOW. 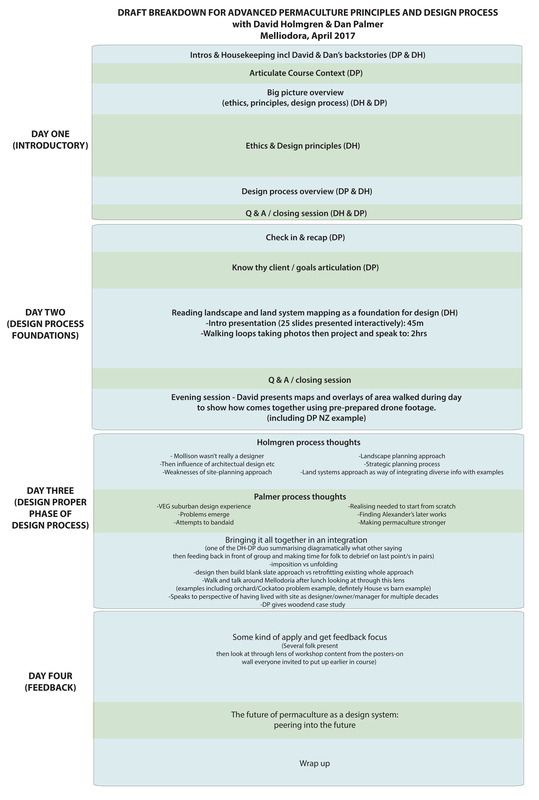 On this four-day residential course, tutors David Holmgren and Dan Palmer will take you through various approaches and methods that they implement in their own design processes to help you establish your own framework for designing and living. Participants are encouraged to arrive on the night of April 10 and camp over, ready to begin the course at 9am on the 11th. Dinner will be provided on the 10th, and brekky on the 11th, as well as all subsequent meals for the duration of the course. 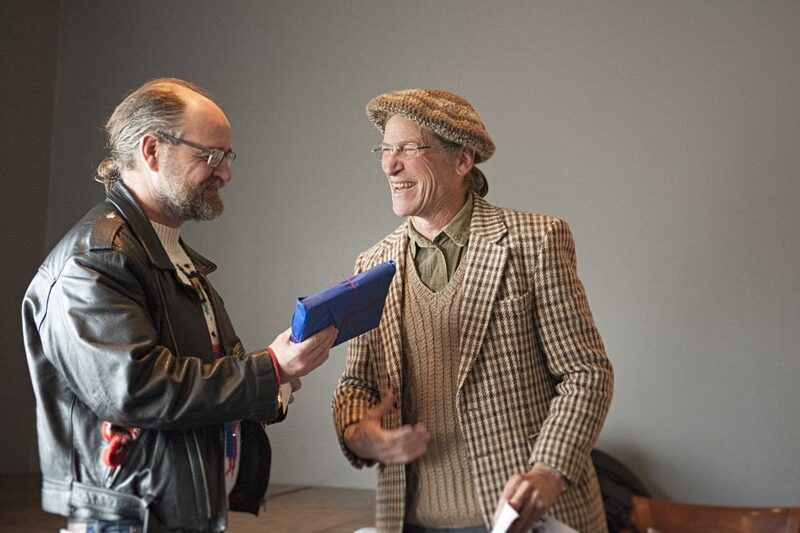 Toby Hemenway, one of the most influential permaculture authors and teachers from North America, passed away earlier this week aged 64. 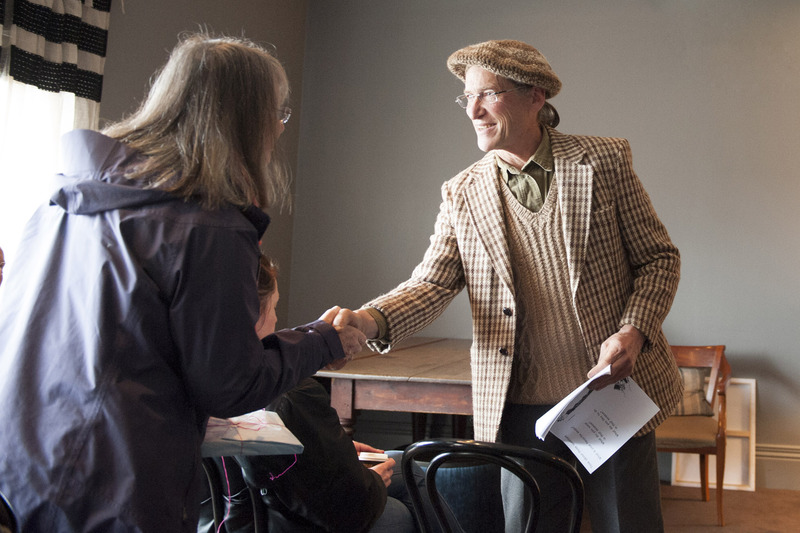 Toby discovered permaculture in 1990 after a career in genetics and developed a rural permaculture property in southern Oregon with his wife Kiel. He was editor of Permaculture Activist magazine from 1999 to 2004 and his book Gaia’s Garden: A Guide to Home-Scale Permaculture is credited as being the most successful book about permaculture in the world, having sold more than 250,000 copies. 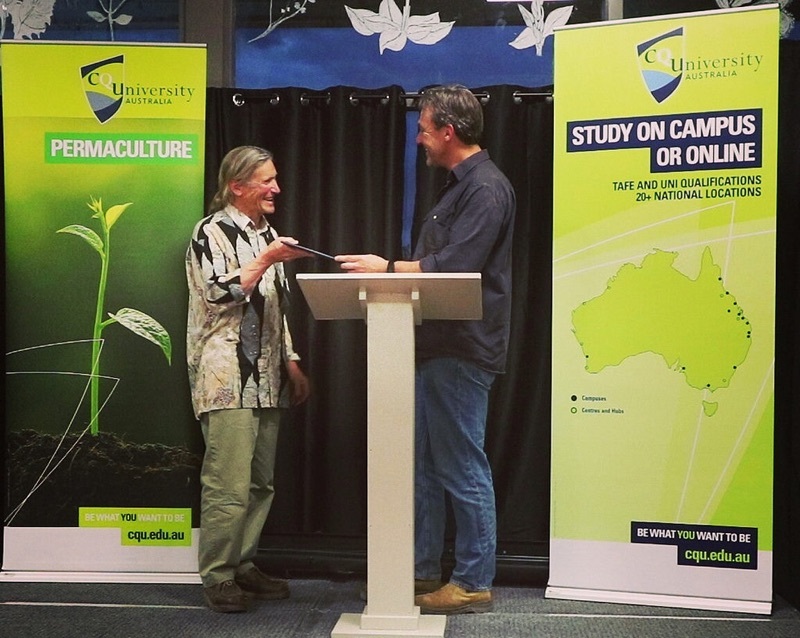 Last month while David was in Perth for the Australasian Permaculture Convergence he gave The Keith Roby Memorial Lecture in Community Science, a free public lecture funded by the Keith Roby Trust, established in memory of Dr Roby. 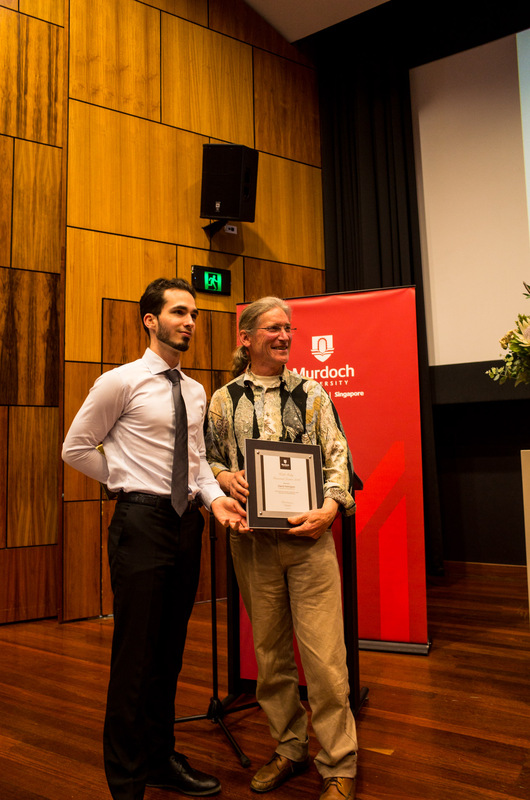 Keith Roby was a foundation member of Murdoch University and a pioneer in the area of “Community Science”, the phrase he coined to reflect the ideal of science and technology directed towards human fulfillment, social well-being and satisfying the fundamental needs of humankind. 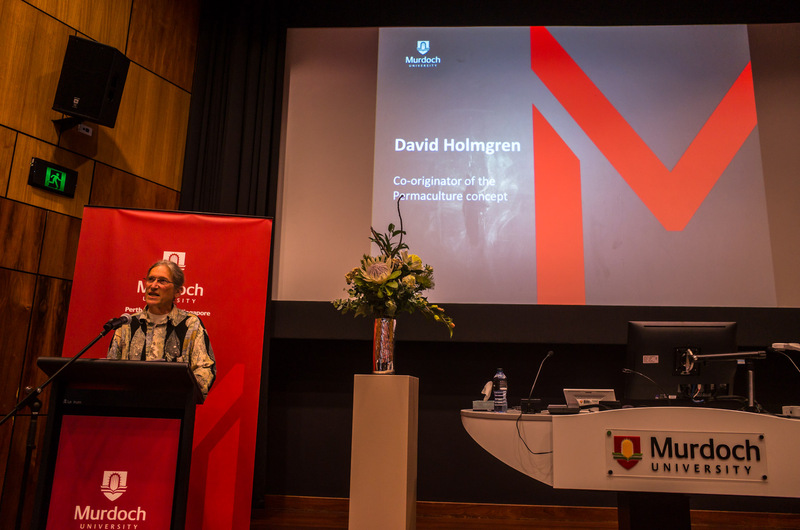 He believed science could make a significant contribution towards resolving major contemporary issues such as the dilemmas surrounding the environment; energy; resources and genetic engineering. With a deep commitment to interdisciplinary teaching and research, he initiated research and founded courses in the areas of science, technology, society and energy studies. And you can read the full transcript here.